Two bedroom staggered terrace home, located close to the local shops and amenities of Farnham Road. Requiring cosmetic modernisation the property benefits from 21ft lounge/diner, gas central heating, part uPVC double glazing, private rear garden and potential for off road parking for two vehicles (STPP). Offering excellent public transport links into Slough town centre, the property is close to both primary and secondary schools, within a mile of Wexham Park hospital and is an easy drive to the M4 and M40 motorways, providing direct access into central London. Entrance Hall - Doors to Lounge and Kitchen, cupboard housing electric meter and stairs to First Floor. 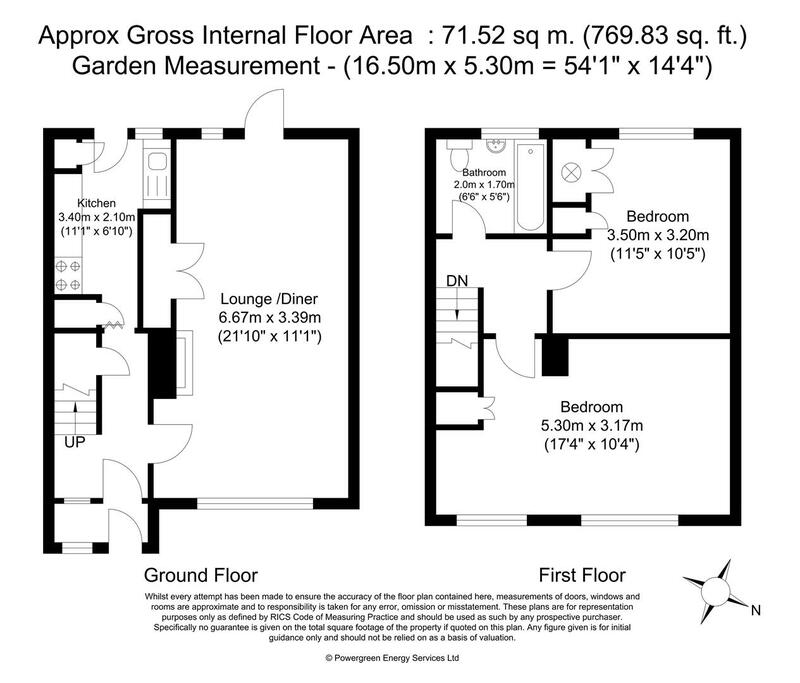 Lounge - 6.81m x 3.35m (22'04 x 11'30) - Front aspect double glazed window, electric fire, radiator, tv aerial point, power points and rear aspect double glazed doors to Rear Garden. Kitchen - 3.35m x 2.21m (11'66 x 7'03) - Range of wall and base units, contrasting work surfaces, stainless steel sink drainer with mixer tap and splashback tiling. Space and connection for gas cooker. Space for washing machine, fridge freezer, cupboard housing gas meter. Power points, radiator, rear aspect double glazed window and door to Rear Garden. Polystyrene ceiling tiles. Landing - Loft hatch, doors to all rooms. Bedroom One - 5.18m x 3.05m (17'59 x 10'33) - Front aspect double glazed window, radiator, power point, telephone point and polystyrene tiles. Bedroom Two - 3.35m x 2.74m (11'34 x 9'51) - Rear aspect double glazed window, power points, cupboard housing water tank and boiler. Polystyrene ceiling tiles. Bathroom - 1.83m x 1.52m (6'68 x 5'54) - Panel enclosed bath with electric shower, wash hand basin, low level w.c, radiator, part tiled walls and rear aspect double glazed obscure window. Front Garden - Laid to lawn, enclosed. Rear Garden - Mainly laid to lawn, access to storage shed and patio area.